Toyota Land Cruiser Prado is the most popular, demanded and all-time favourite 4WD Sports Utility Vehicle of the present era. It is specifically designed to beat the off-road wild fun adventure for the entire family. It is a successor of the land cruiser which is still the most selling SUV in the world. Toyota Prado has a robust and finest exterior design which exhibits its luxury and versatility with impressive looks for customers. It has also a comfortable interior highly equipped with latest and modern technologies and enhanced cabin space to provide customers with an enjoyable road journey experience. Toyota Land Cruiser Prado has successfully ruled its popularity in the market for a period of more than 2 decades and is still in demand. It was first manufactured in 1990 by Toyota Motor Corporation and quickly became the most selling car due to its off-road heritage. This rugged sporty vehicle got its sheer reputation and recognition for leisure and adventurous activities all around the world. It can easily ascend the Rocky Mountains and sandy deserts by its 4×4 powerfully dynamic wheel drive. The upcoming and latest Land Cruiser Prado 2016 has come up in the market with a new refined look, reduced size and extreme comfort for customers. The new design is really incredible as compared to older versions and has a compact trendy superior look. The exterior is super impressive with extremely powerful beaming headlights to provide safe and secured long drive journey at night. The front bumper and grills have given more enhancements to give it a hard and firm design structure. Moreover, the powerful and stylish alloy rim wheels add more beauty to this sporty leisure car. This makes it a perfect speedy joyful ride vehicle on both on-road and off-road tracks. Let’s have a look at the above features in details. The new Prado has come up with more colourful and compact SUV exterior Design for customers. The reduced size has increased its appeal so much with added features of 17-inch alloy wheels, elegant headlamps, front fog lamps and rear spoiler. Exterior powered mirrors are superb for crystal clear visibility and trendy front bumper grill lines give it a masculine look. It is specifically designed for all-terrain activities with pleasurable driving experience for everyone who always are in seek of keen excitement and amusing road journey. This new Automatic Toyota SUV provides extreme driving safety at night. It provides passengers softly blowing airbags to keep them safe and protected from sudden jerks and unexpected accidents. It has added advanced features of vehicle stability control, rear parking sensors, and a rearview camera. By means of performance, it marks superiority on others by having 160 horsepower 2.7 litres four-cylinder engine and also a four litres v6. It has a 6-speed automatic transmission along with the six-speed manual for high mileage speed precision. The new addition of 2.8 litres four-cylinder turbo diesel engine adds more value with less fuel consumption. This car is fully equipped with the latest technology with having a decorative interior and seven seating spacious capacity. The features include advanced WI-FI and blue tooth with Universal Serial Bus Connectivity, iPod Box, six-speaker stereo audio and telephone controls with air-conditioning. 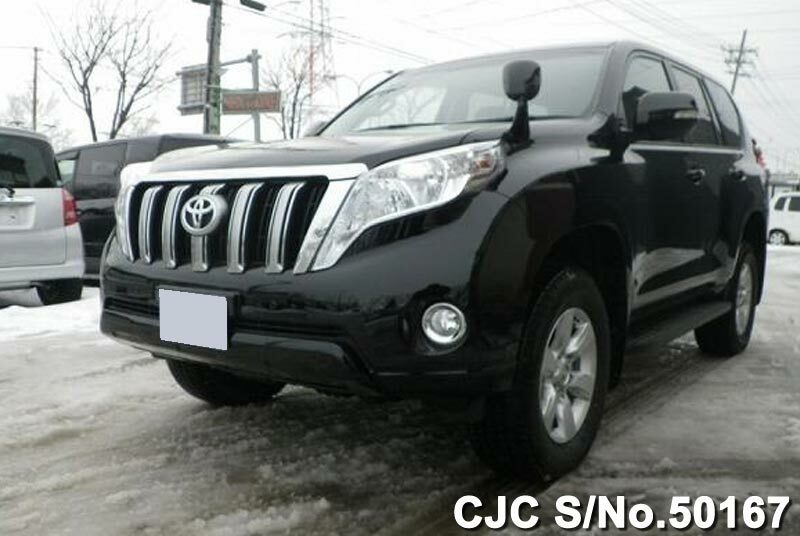 Car Junction is a leading and renowned Japanese used and new cars exporter offers Toyota Land Cruiser Prado for Sale at affordable prices for customers. Our locations are spread over Asia, Africa, Europ, and the Caribbean.